The common sites for metastasis of bladder cancer are pelvic lymph nodes, lung, liver, bone and adrenal gland. Isolated adrenal metastasis is rare. Some reports have suggested a survival benefit after postchemotherapy surgery. 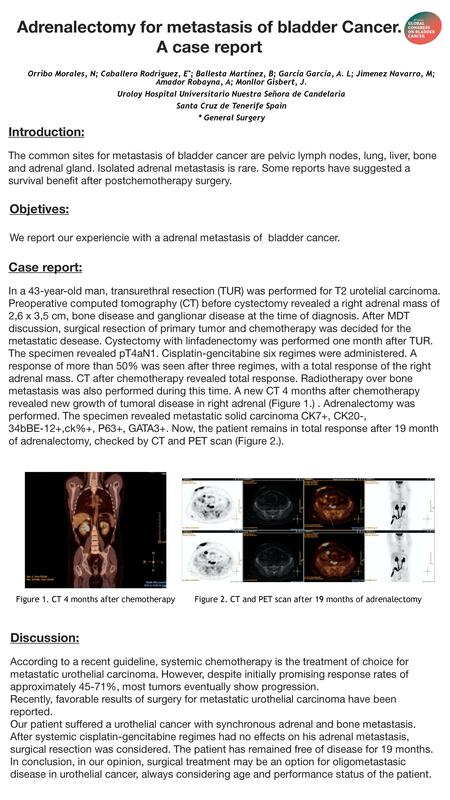 We report our experiencie with a adrenal metastasis of bladder cancer. In a 43-year-old man, transurethral resection (TUR) was performed for T2 urotelial carcinoma. Preoperative computed tomography (CT) before cystectomy revealed a right adrenal mass of 2,6 x 3,5 cm, bone disease and ganglionar disease at the time of diagnosis. After MDT discussion, surgical resection of primary tumor and chemotherapy was decided for the metastatic desease. Cystectomy with linfadenectomy was performed one month after TUR. The specimen revealed pT4aN1. Cisplatin-gencitabine six regimes were administered. A response of more than 50% was seen after three regimes, with a total response of the right adrenal mass. CT after chemotherapy revealed total response. Radiotherapy over bone metastasis was also performed during this time. A new CT 4 months after chemotherapy revealed new growth of tumoral disease in right adrenal (Figure 1.) . Adrenalectomy was performed. The specimen revealed metastatic solid carcinoma CK7+, CK20-, 34bBE-12+,ck%+, P63+, GATA3+. 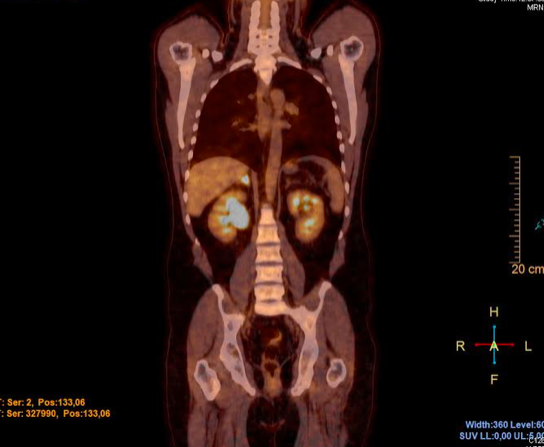 Now, the patient remains in total response after 19 month of adrenalectomy, checked by CT and PET scan (Figure 2.). According to a recent guideline, systemic chemotherapy is the treatment of choice for metastatic urothelial carcinoma. However, despite initially promising response rates of approximately 45-71%, most tumors eventually show progression. Recently, favorable results of surgery for metastatic urothelial carcinoma have been reported. Our patient suffered a urothelial cancer with synchronous adrenal and bone metastasis. After systemic cisplatin-gencitabine regimes had no effects on his adrenal metastasis, surgical resection was considered. The patient has remained free of disease for 19 months. In conclusion, in our opinion, surgical treatment may be an option for oligometastasic disease in urothelial cancer, always considering age and performance status of the patient.